- Is your child often sick with acute laringitis, otitis, tonsillitis, or adenoiditis? - Does he/she breathe through his/her mouth during the day? - When he/she sleeps have you ever noticed if he/she breathes through his/her mouth? - Have you ever heard him/her snore while sleeping? -Does your child still use the pacifier or fall asleep sucking his/her own thumb? -Does your child still drink milk from the bottle (over 3years of age) ? -Have you ever noticed if he/she has the habit of sucking his/her lower lip, as shown in the picture below? from the age of three! a dental check up appointment before the age of five! -Have you noticed if the mandible of your child is more external compared to the upper maxillary arch (inverted bite, as shown in these pictures)? When your child smiles do you see any open space in the front (open bite, as shown in the picture below)? 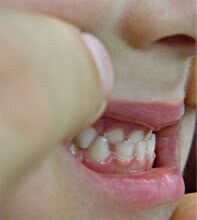 - Are the lower teeth more external to the upper teeth while he simply bites down (cross-bite, as shown in the picture above)? Is this only on one side or on both sides ( monolateral or bilateral crossbite) ? - Have you noticed if your child often puts his/her tongue in between of the two dental arches, especially while swallowing (Tongue thrust )? 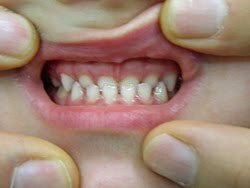 - When your child smiles have you ever noticed if you can only see his/her upper teeth and not at all the lower-ones as the edge of the upper teeth is almost touching the inferior gums (deep bite, as shown in the picture above)? did you ever noticed if your child have decays or a situation of decays that had caused the total colaps of the bite?